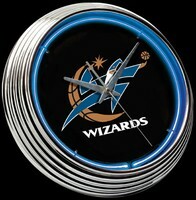 Washington Wizards Neon Clock 15"
Brightly display your team pride with an officially licensed NBA neon wall clock. It's the ultimate clock for any National Basketball Association (NBA) fan and makes a great showpiece in a game room, bar, or rec room. High quality 3/8" diameter neon glass tubing around screen-printed team logo. High quality 3/8" diameter neon glass tubing. Clock mechanism powered via AA battery (not included), 110-volt power adapter to power neon included. Aluminum hands with sweep second hand. Clear glass front never discolors and cleans easily without scratching. Neon tube lasts up to 12 years, even when lit 24 hours a day. 15" diameter, approx 2.5" deep. 6' power cord. Weighs solid 5 pounds. 1-Year Factory Warranty.